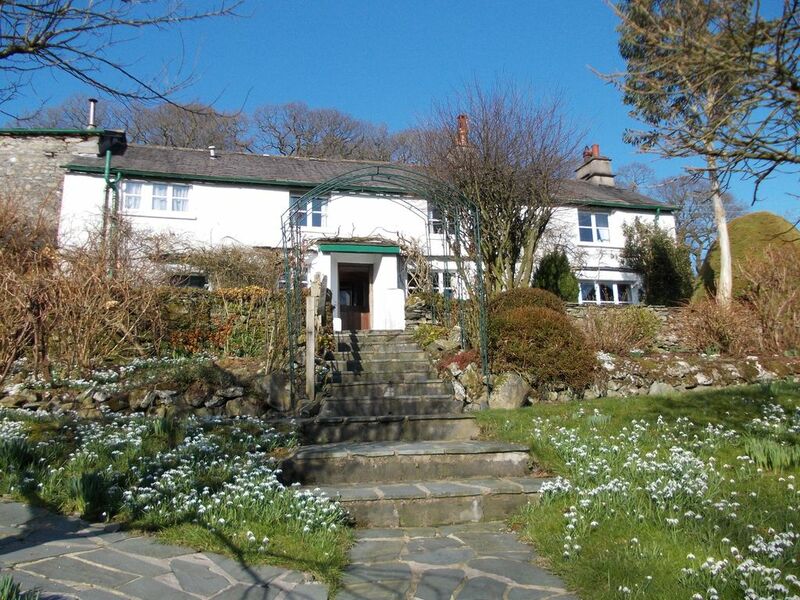 Sunny Bank Farm is a spacious and beautifully furnished 17th century farmhouse set in large grounds, with lovely lawned garden and private frontage to Coniston Water. An open fire (firewood provided), central-heating and double-glazing throughout make it an excellent year-round holiday venue, and an ideal base for walking, touring, boating or just relaxing in peaceful surroundings. There are 2 double bedrooms, 2 twin, 1 triple and 1 single on the ground floor. There are 2 lounges, both with comfy sofas; one with TV, the other with open fire, music system and large window seat giving a splendid view of the garden and the birds landing on the feeders (bring some peanuts!). The open-plan kitchen and dining room easily accommodates 12 people and has everything you will need for quality holiday catering and a comfortable environment for multi-course extended dining! Sunny Bank's grounds are clearly visible in the new Swallows and Amazons film. 'Wild Cat' island is just 15 minutes row away (boats available for hire) - a really fun place to visit. Sunny Bank Farm is owned by a group of friends who are now dispersed throughout England. We are all passionate about the Lake District and particularly the Sunny Bank area and Coniston Water. We regularly come and stay at Sunny Bank ourselves and so we put a lot of thought and effort into equipping it with everything you could possibly need and ensuring that it is in excellent condition for our guests. toilet, shower, Handy after a lake adventure! All bathrooms have recently been newly refurbished. 2 lounges. One with TV, one without for chatting, games and listening to music. With useful 30-minute program for all but the worst cases! Sunny Bank lies at the heart of England’s beautiful Lake District National Park. Here one can enjoy the peace and tranquillity of the countryside so beloved by Wordsworth, Beatrix Potter, Arthur Ransome (to name but a few) and yet be within easy reach of charming villages and towns with all the attractions they have to offer. Sunny Bank has so much to offer you can forget your car for the whole week if you want! Relax and enjoy the beautiful garden, or stroll down to the lake and be stunned by glorious and ever-changing views from the shore. Watch the waterbirds and occasional sailing boat on this quiet corner of the lake; or get in one of our boats and paddle out to explore the enchanting island. Take a walk along the shoreline or stride up onto Torver Common for breathtaking views of Coniston Old Man and the whole lake. There are plenty of superb walks or hikes right from the doorstep, in all directions and for all ages and abilities. Sunny Bank Farm is 4 miles from Coniston, a small but busy typical Lakeland town, and just three-quarters of a mile from Torver, where there is an excellent pub. Popular tourist centres such as Ambleside, Grasmere and Hawkshead are about half an hour away by car. The grounds (16 acres) are bordered by Torver Common and the Cumbria Way to the north and grazed farmland to the south; across the road is Torver Beck and more farmland, and to the east a long stretch of lakeshore onto Coniston Water. Sunny Bank Farm is an ideal location for mountain walking, boating, swimming, sailing and other water-based activities.